The potential of Shopper Marketing? Insight: Chocolates could be placed with sanitary napkins as food cravings increase week-10days before the menstural cycle. Execution: Develop a parasite unit with a simple message. Vs. developing a campaign, buy media space, wait for months to test associations. Shopper Marketing team reports to Sales. Huh? Shopper Marketing team (not a department) reports to Brand Marketing. Should they? Shopper Marketing person reports to Category Head. What are they reporting? Alignment of consumer marketing and shopper marketing strategies through a closer collaboration between internal marketing teams is required. While many businesses today have created stand-alone teams; shopper marketing requires a cross-departmental approach involving members from sales, marketing and procurement teams – as all three play an important role in ensuring that the shopper marketing strategy is defined and implemented effectively. All cannot work in isolation. By the end of 6 months all this team will have to show is a few slides of insights implemented in a half baked fashion. I’d ask my peers steer clear of joining a Shopper Marketing team that does not have at least a 3 year agenda,moneys to back your work and reports to the top management. Shopper segments are today restricted to nice-to-have powerpoint slides. Criminal waste of the research spends. It is relatively simple to use the knowledge of shopper segments – Budget shopper needs to dictate deals and offers and the Quality shopper needs to have a say in the product and retail brands need to device campaigns to convert browsers. Staff could be trained to identify and customise approach for each shopper segment. Does it happen? Not in most cases. Key reason is non alignment of departments – operations thinks it is a waste of time, training believes it is not necessary etc. Which only goes to prove there is a lack of belief and commitment towards the value of the discipline of Shopper Marketing. This entry was posted on October 14, 2014 by thebuystories in Customer Experience Management, insights, our work, Shopper Marketing and tagged Aaradhee Mehta, best practices in shopper marketing, budget shopper, Buystories, future of shopper marketing, shopper, Shopper Journey, Shopper Marketing, Shopper Marketing 2014, shopper profiles, shopping experience, tyre purchase experience. 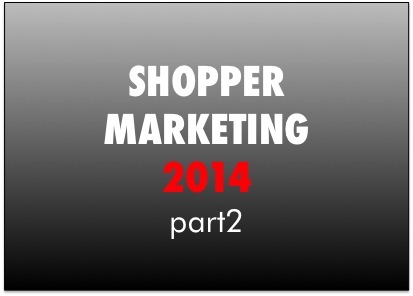 So what is shopper marketing?